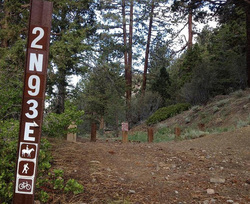 Wildhorse Trail - Santa Ana River Trail SART Singletrack - Big Bear Mountain Biking Trail Guide Maps GPS - Hiking Trails too! Wildhorse Trail is "Segment Zero" of the Ultimate Sugarloaf to SART descent! Wildhorse is an advanced downhill Singletrack trail! No drops, just technical loose rocks at the beginning, turning into fun rideable trail for the most part. Yes, you can ride your bike down from Sugarloaf Peak, down Wildhorse Trail to Southfork (SART) to Angeles Oaks to Morton Peak to Redlands. Mostly all on Singletrack! 9950ft to 1500ft at hanger 24 Brewery in Redlands! See the Ultimate SART Santa Ana River Trail Guide for other segments! The Everytrail app lets you favorite this trail. Then run the app on your phone and when you get to the trailhead, just follow the blue line in Everytrail and you have a nice way to find the route. Your favorited routes are overlayed on a google map in the app. Move mouse over waypoints on map for notes on trail.